The sun shone brightly in La Paz, Bolivia on election day this past Sunday. The cars and buses that usually fill the winding streets were prohibited for the day in order to prevent people from voting more than once in different locations. 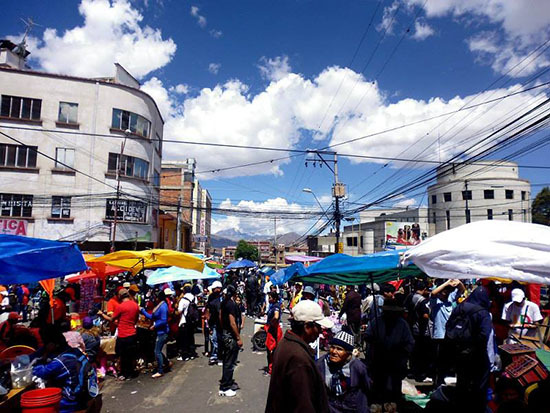 The sun shone brightly in La Paz, Bolivia on election day this past Sunday. The cars and buses that usually fill the winding streets were prohibited for the day in order to prevent people from voting more than once in different locations. As a result, the air was crisp and clear, and children played soccer in the open roads, bicyclists took advantage of the freedom, and families enjoyed picnics and games while street vendors sold barbecued beef and chicken. It was a day of voting, but for many people in La Paz, it was also a celebratory time with family. As we now know, the voters that day would go on to grant President Evo Morales a third term in office with roughly 60 percent of the vote. It wasn’t a surprise that Morales and many members of his party won the election. As I’ve pointed out elsewhere recently (see this article for the implications of the election and this look back on Morales’ time office), Morales was likely to win in part because of the success of his administration in lifting people out of poverty, empowering marginalized sectors of society with funding to school children, mothers and the elderly, and building new infrastructure and public works projects. The funding for such programs largely came from newly nationalized industries and businesses. However, serious criticisms of the MAS took the limelight in the lead up to the elections. For example, in recent months a movement grew momentum against sexist comments from political candidates and a wave of violence against women in the country. Outspoken critics from the left continue to critique the MAS’s emphasis on an extractive-based economy in mining and gas; while such industries have created funding for the government, they have also polluted the land and rivers, and displaced rural and indigenous communities. 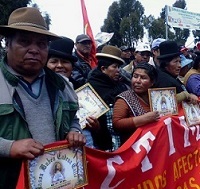 In addition, the Morales government recently passed a law which criminalizes protest against mining operations, and grants more water rights to miners than to local farming communities. In its drive for political hegemony, the MAS has also co-opted and divided some of the country’s social movements, leading to less autonomy and open criticism among grassroots activists. Morales himself recently reflected on what is perhaps a growing pitfall of the MAS – its reliance on Evo as a central feature of its popularity, something the president has of course perpetuated and encouraged. However, after Sunday’s election he told the BBC that he heard a critique from a union leader during the campaign who told him, “Evo, you are really bad.” Evo responded, “Why bad?” The explanation: “Because you have eliminated the MAS. Here there are no Masistas, there are just Evistas.” Morales told the BBC, “This has me worried. Clearly, someone has to lead… I understand this Latin American way of thinking that everything is always about a single person, but I don’t like it.” Morales has said throughout the current campaign that he doesn’t plan to seek another term. 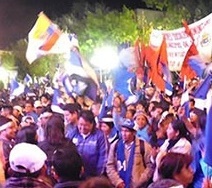 After Morales announced his victory, celebrations filled the Plaza Murillo in La Paz, with folk music playing late into the night. The blue and black colors of the MAS party mixed with the multi-colored Wiphala flag, representing the many indigenous groups in Bolivia. 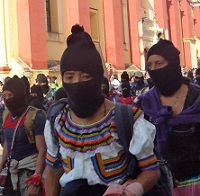 Members of the various campesino, workers and indigenous organizations that work closely with the MAS were well represented in the festivities. As with any presidency, contradictions and challenges still abound; Morales just announced plans for a controversial nuclear power plant to be built in earthquake-prone La Paz. Abortion is still largely illegal in the country, and from January to September of this year 157 women were murdered. Toxic fields of soy are expanding in the eastern part of the country with the MAS government’s blessing. And some of the very indigenous and rural communities that government programs are meant to support are being displaced by extractive industries across the country. 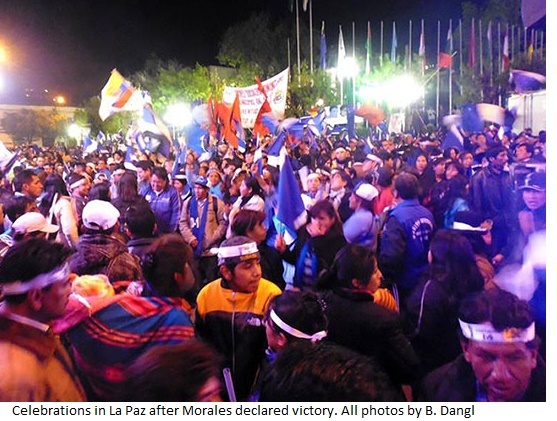 For more interviews with voters in La Paz see this article.